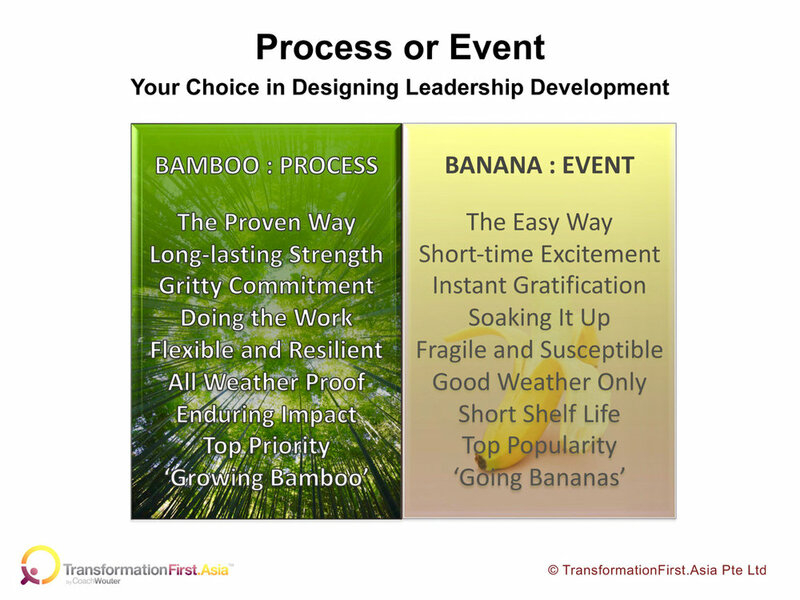 Manila, 23 January 2019 — What is the training model in your business: Bamboo or Banana? Discover why that matters. In January, staff in many businesses and organizations will select what training to include in their work plan for the year. Have you already done so? If you are lucky, you can find an opportunity to boost your leadership skills. An important question, however, for you and for your company, is how effective the training will be. Globally, an estimated $350 billion dollar is invested annually in employee training. Unfortunately, research has shown that most of that training fails to produce the desired productivity and performance results which, in many cases, require specific behavior changes. This failure of training has been studied at Harvard, McKinsey, and by other consultants and academic researchers. The most important shortcoming of conventional training that has been uncovered by these studies is, in my view, that they are organized as an event rather than a process. I’m sure that you have experienced this for yourself and colleagues around you. No matter how enjoyable training events can be, including the insights they can give you and the inspiration to lift your motivation, you and I know It takes more than a lecture, seminar, workshop, hackathon, or innovation lab, to change your behavior. We urgently need different and better approaches to training in general, and leadership development training in particular. Thankfully, the knowledge how to do this is already available. In the diagram below, I have made a clear distinction between two paradigms. On the right you see the event-centered approach to training. Let’s call that the Banana paradigm. This is the most popular form of training around the world, and the favorite way of HR departments to organize training. It is The Easy Way for all concerned. When the event is done well—and many trainings fall short of this objective—the participants will experience a short time of excitement, and some degree of instant gratification from what they have learned. The training content is delivered so that it can be soaked up, preferably in a short time. I see evidence around me that the length of training is coming under more and more pressure in many businesses. Efficiency is often measured in how fast a training can be delivered, with less emphasis on how effective the training is to bring about the desired changes. If there is an evaluation, it is usually limited to participant satisfaction rather than checking on actual changes and results. No wonder that a tangible return on investment (ROI) remains elusive for most trainings. As a result of the preference for rapid event-based training delivery, the participant’s ability to apply the training is fragile at best, and susceptible to many factors including their manager’s support or lack of support. Without adequate opportunities to practice and reflection on what they have learned, the trainees quickly discover that their new knowledge and skills are not ‘weather proof.’ The materials they received end up having a short shelf life before disappearing somewhere in cyberspace, and what they learned is often quickly forgotten. While the training event can be a happy occasion with many joyous photos, suggesting that the participants had a good bout of ‘going bananas,’ the results are, more often than not, unsatisfactory. 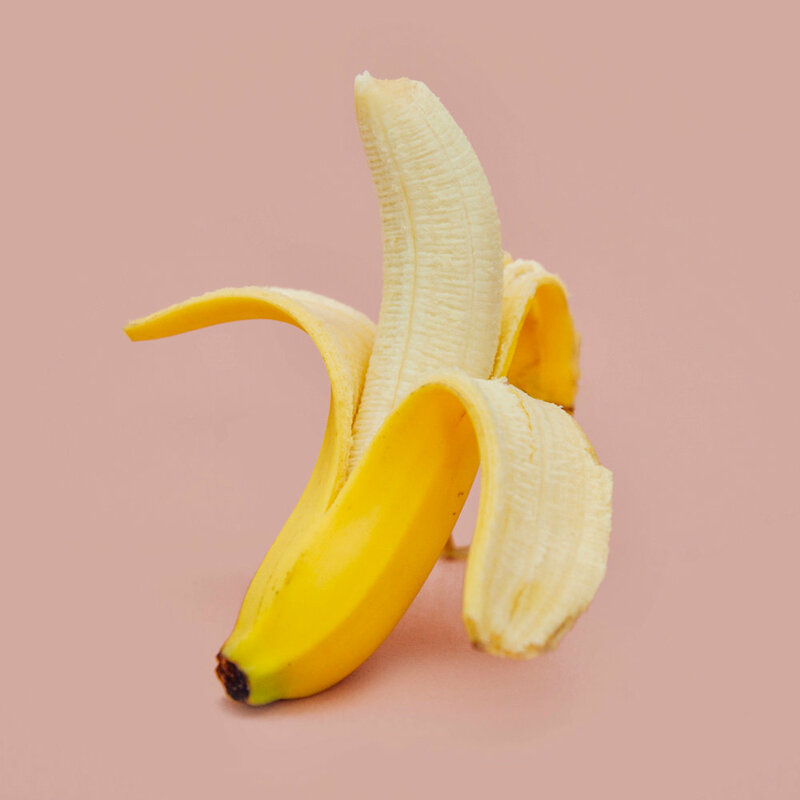 One of the reasons that businesses continue applying the Banana paradigm is, according to the researchers, that many HR departments lack the necessary knowledge and influence to confront and persuade their management for a paradigm shift to a better approach. Furthermore, many executives sadly still operate in a traditional top-down approach with insufficient understanding of how to boost performance and lead innovation and change in a manner that engages and empowers staff at all levels of the organization. Do you get the drift of the Banana paradigm? Can you see its shortcomings? Then it’s time to look at the Bamboo paradigm. The Bamboo paradigm looks at leadership development, and training in general, as a process that takes (much) more than a training event. Much has been written about bamboo as an inspiring metaphor for leadership development. Bamboo grows very fast, but only after investing to build a strong healthy root system below the ground. It takes a new bamboo several years to be seen. Actually, what bamboo and bananas have in common is that they both grow from a root system with what are called rhizomes. The difference is that a new banana ‘tree’ will sprout and grow to bear fruit in about nine months, where bamboo takes several years. However, when a bamboo finally shoots up after completing all that preparation work underground, the speed of growth is unequalled by other plants and trees. For some species, you can literally see it grow as you watch. That’s how bamboo stands out. Apart from its ‘gritty commitment’ to invest first in its roots under the surface—where 50% of the plant mass is located—bamboo has many other attributes that inspire trainers who see leadership development as a process rather than an event. Bamboo is famously flexible and resilient to temperature changes and storms. It bends and never breaks. It is open at the center, resembling leaders who are receptive to new ideas. It has long-lasting strength, and the impact of planting bamboo is enduring. When using the Bamboo paradigm to plan and implement training, including leadership development, the focus is never on just one event. Rather, the top priority is to support participants to grow through a longer process that starts ‘underground’ with work on their mindset, values, beliefs, and behaviors. The way I apply the Bamboo paradigm, and use it wherever I can, is that a training should include at least three phases for every single participant. The first phase of the process of the Bamboo paradigm is where we gather insights and conduct one or more assessments of the situation that the business and the participants are in, including their apparent problems and needs for change. The second phase is where we design solutions together to improve the situation, with suitable goals, and desired, measurable results. Often, this is best done by coaching the participants (and stakeholders) through their inquiry and exploration. The solutions can then include a combination of new knowledge, mindset change, value alignment, new skills and behaviors, and designing how to practice. In the third phase, the participants implement what they learned and developed by engaging in challenging assignments on-the-job, with frequent times for reflection and feedback. They are supported by coaching, mentoring, micro-learning, and metrics to measure both their investment and results. Now, can you see how different this process approach of the Bamboo paradigm is from attending a training event in the Banana paradigm? In my thought leaders practice, I am always looking for opportunities to engage with clients in a process, using the Bamboo paradigm. When opportunities show up to help new clients by delivering a training event, I will explore opportunities to make that event the start of a longer-term process of supporting changes, both in the organization and individually. In the past couple of years, I found that a ‘low-hanging fruit’ opportunity for using the Bamboo paradigm came when I offered participants an online course with worksheets to reflect and practice, ahead of the live training event. In several cases, I was also able to include individual coaching sessions into the training. However, I want to go further to see the Bamboo paradigm embraced by executives, HR, and staff much more widely, because of the much better results it delivers. So far, a good example for me in using the Bamboo paradigm has been where I work with partners to support participants through a 9-month leadership training program that includes assessments, design of behavior changes to be implemented in a challenging leadership project by each participant, and several rounds of one-to-one coaching to support them through the process. I am now designing further training programs that are similarly grounded in the Bamboo paradigm—The Proven Way—for producing lasting behavior changes and significant improvements in performance and results, by working together through a process. If the Bamboo paradigm looks interesting to you in your business or organization, or to pursue your leadership development on an individual basis, let me know and we can set up a call to discuss what you need. That helps to kick off the first phase of the process!